This is one of seeking items from collectors all over the world. It's rare. This is one of 4 postcards issued in 2010. This postcard shows that Thai Airways provided all senses - See, Hear, Smell, Taste and Touch to satisfy customers. 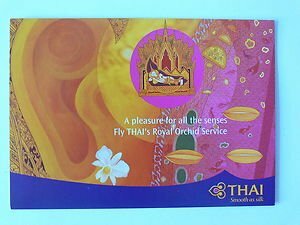 Also, it comes with Thai Logo and wording "A pleasure for All the senses - Fly THAI's RoyalOrchid Service". Don't miss it.